The police yesterday said that a modified car involved in a fatal accident on the Negombo-Thalahena road last Saturday at 8.30 pm (Oct 29) had been racing with two other cars at the time. The accident claimed the lives of two police constables, Lalith Yasanayake (39) and Shaminda Shanaka (31) attached to the traffic branch of the Negombo police. brought to his notice by several passersby. The constable had pursued the fleeing van on his motorcycle and blocked its path and rescued the boy. PC Yasanayake had also apprehended all five suspects. A police spokesperson denied allegations that those who had been arrested in connection with the abduction were involved in Saturday’s accident. The official emphasized that there was absolutely no basis for a spate of posts on the internet propagating a connection between the accident and the PC Yasanayake’s intervention to rescue a student. The police said that the Toyota Mark II speeding on the wrong side of the Negombo-Thalahena road had smashed onto police motorcycle proceeding towards Pamunugama. Those who had gathered at the scene assaulted the driver and his companion before police rushed to the scene, an official said, adding that the constables were on duty. The suspect’s companion, Kodikara Arachchige Ignatius Randula Perera (30), of the Nations Trust Bank, Negombo, too, had been under the influence of liquor at the time of his arrest. The police had given him bail. Responding to a query, the police identified the Indrajith as a son of the owner of several jewellery shops. The police said that there had been altogether three cars, including the one driven by Indrajith racing towards Thalahena. The suspect had driven on the wrong side regardless of oncoming vehicles. After colliding with the motorcycle, the car had pushed it more than 50 meters before smashing onto a parapet wall. The police motorcycle had caught fire and bodies of constables were burnt to some extent due to the fire. According to police, the two other vehicles involved in the accident had fled without stopping. The police said that over the weekend some persons raced after consuming liquor. Prayers were conducted at Ave Maria Convent, Negombo on Monday (Oct 31) especially for Shaminda Shanaka as he had been tasked to direct traffic at the main entrance of the school. 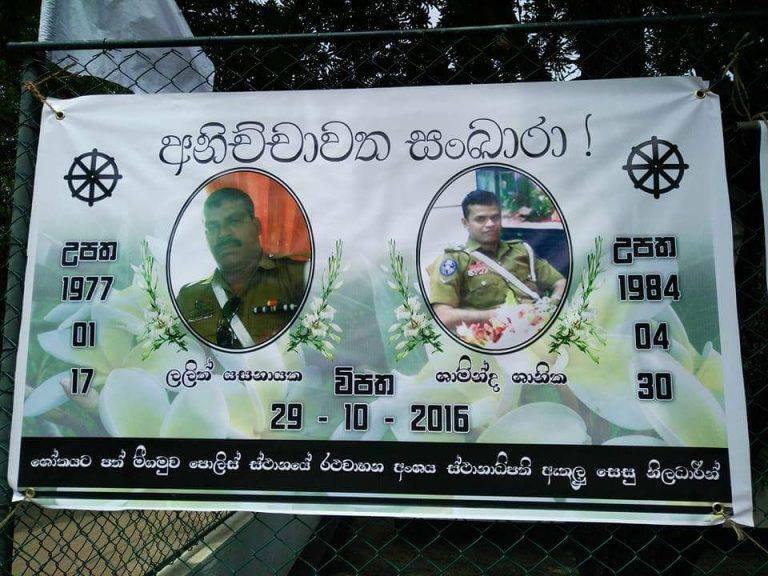 People put up banners in Negombo and its suburbs expressing grief for the untimely deaths of police officers. PC Shaminda Shanaka funeral was held at Dankotuwa on Monday. 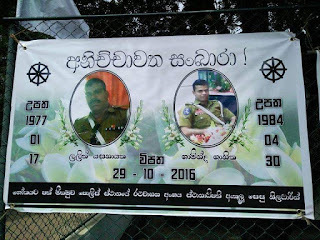 PC Yasanayake’s funeral took place at Anamaduwa yesterday.